This sturdy mobile unit provides double-sided storage and an easy-to-clean worktop all in one. 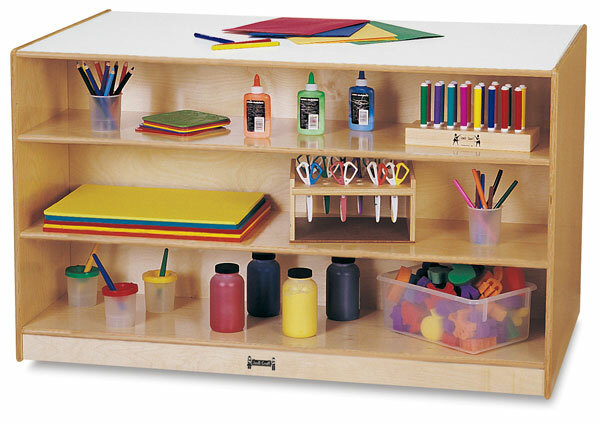 One side features three roomy shelves, 7½"H × 46½"W × 14"D. The other side features two shelves, 12"H × 18"W × 14"D, and twelve cubbie holes, each measuring 5½"H × 8¾"W × 14"D.
This versatile unit features KYDZStrong construction with a white laminate worktop and KYDZSafe edges. It’s mounted on casters for maximum mobility. 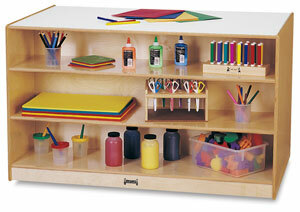 Overall size is 29½"H × 48"W × 29"D. Standard cubbie tray colors are Red, Blue, Yellow, Green, and White.